Want a quick & easy tip to make your ceremony photographs more fun and memorable? Arrange to have guests throw flower petals, rice, confetti or even blow bubbles during the recessional as you make that first trip down the aisle as husband and wife! I swear there is just no better way to instantly create joy in a photo! "One of my favourite memories of the wedding was ... of course, the ceremony. I think my favorite photos are the ones of Nick and I standing at the end of the aisle, with the old tree and the chateau turret in the background, framed by the barrels and flowers. We both smiled from ear to ear for the whole ceremony and that is reflected in the photos." To read more about Josie + Nick's intimate French chateau wedding in the countryside near Bourdeaux, please see the French Wedding Style blog here. 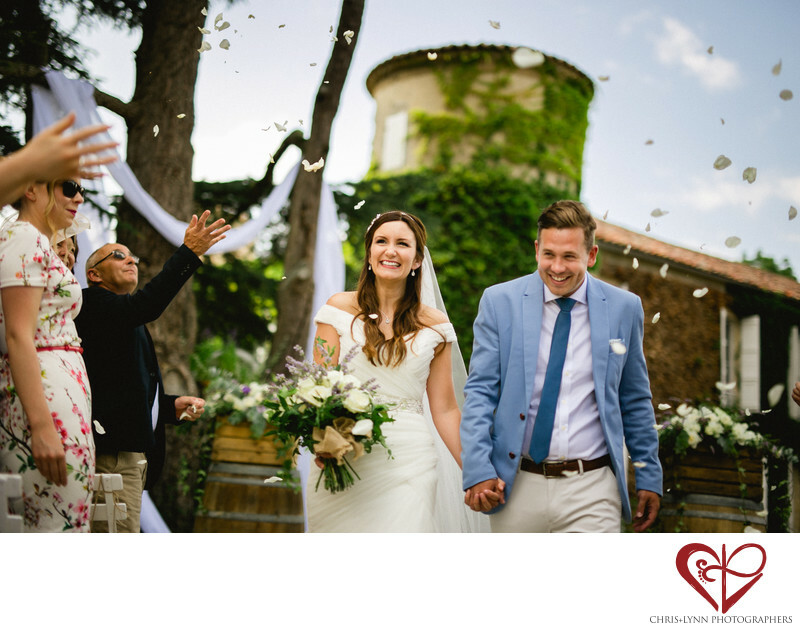 Chateau de Malliac (also known as 'La Belle Vie de Chateau en Gascogne) is one of our favorite French wedding venues, and is located about an hour from Agen, France. 1/2000; f/1.4; ISO 100; 50.0 mm.